Some days I want an uber sophisticated dessert. One that takes a lot of skill, looks amazing and will make people go ‘wow’. And other days it’s all about something quick, easy and delicious. Today’s recipe is one for the quick and easy moments in your life. When you can’t be bothered to turn on the oven and you just want a chocolate feast. 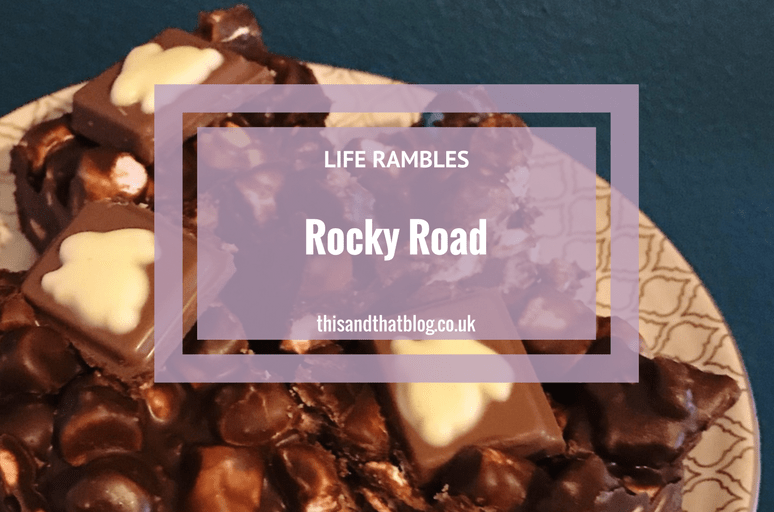 During those times rocky road is the answer. Rocky road is the simplest thing in the world to make. It’s one of those melt, break and mix it all together recipes that anyone can do. To make this rocky road even more fantastic I’ve added in Easter treats in the form of Smarties Mini Eggs. Because if you’re baking within six weeks before Easter it is essential that all baked goods contain something Easter related. Am I right, or am I right?Previous bakes that follow this thinking include mini egg blondies, which are my favourite tray bake in existence, and the classic creme egg brownies. Melt the butter in a large pan over a low heat / once half of the butter is melted add in the chocolate chunks and the syrup / continue to melt until all the ingredients are melted and combined / remove from the heat and leave to cool – about 10 minutes. Once it’s cooled add in the biscuits, marshmallows and mini eggs / stirring well to coat everything in the chocolate mixture / pour into a lined tin – we used a 8″ x 8″ brownie pan / top the rocky road with squares of Easter bunny chocolate / place in the fridge to cool and harden. Once it hardens cut it into smaller pieces. We made about 24 pieces out of this. So the perfect amount for an Easter gathering or the work treats table. So there we have it, the easiest of recipes for a delicious treat over the Easter break. Do you have a favourite rocky road recipe? What do you add to yours?